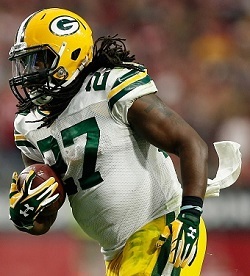 The Green Bay Packers and I’m sure Eddie Lacy himself were disappointed by his production in 2015. In response to that Ian Rapoport of NFL.com reports that the Packers want Lacy to lose weight this offseason, specifically 30. Rapoport also says that Lacy is fully committed to this. There’s a lot of question about how much Lacy actually weighs. He’s officially listed at 234 pounds but when you look at him you have to question if it’s the real weight. You have to question it even more when the Packers say they want him to lose 30 pounds. When Lacy came out of Alabama he was listed at 220 pounds and up to 231 by the time of the NFL Scouting Combine. That was an amount the Packers were fine with, so if he’s only 234 now why do they want such a drastic weight loss. There’s only one reason he has to weigh much more than that. Some rumors have him weighing close to 250 which would explain the 30 pound number. Even if he didn’t hit that amount he’d be back in that 220-230 range that he came into the NFL at. If he truly follows through and loses the weight maybe he’ll get the quickness back that he used to have. Hopefully he does because right now he’s just an over paid big body that’s not producing.